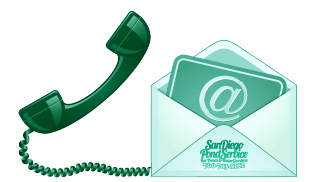 OUR COMPANY: San Diego Pond Service is a reliable, honest, knowledgeable, and affordable pond service company! Our maintenance staff has close to ten years of pond cleaning experience. We are a family owned business, based out of North County, San Diego. We love koi ponds and specialize in pond cleaning, koi care, pond maintenance, water garden maintenance, complete pond clean-outs, aquatic plant mgmt, filter/pump installation, and much more! 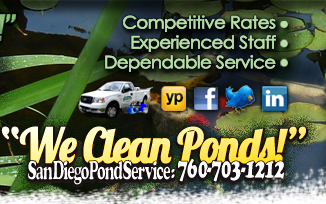 Looking for dependable pond service? Call SDPS today and ask about your free pond consultation. Keep your koi pond or water garden beautiful and leave the dirty work to us! POND SERVICES: Koi care, pond ecosystem management, the role of aquatic plants, and proper pond filter system care are our specialties. This delicate balance is the key to a clean, healthy koi pond habitat. Our services include: Consultations, Maintenance, Clean-outs, Powerwashing, Pond Vacuuming, Muck Removal, Filter Cleaning, Pump Maintenance, UV Service, Algae Control, Aquatic Plant Management, Water Testing, and Koi Care.